This style is identified by its dancing baseline and charmingly irregular characters. Perfect for any occasion formal or fun- mostly fun. A traditional option for your most tailored affairs. Copperplate is an American schoolbook style script developed alongside Spencerian, identified by it's notable thick&thin strokes in each character. 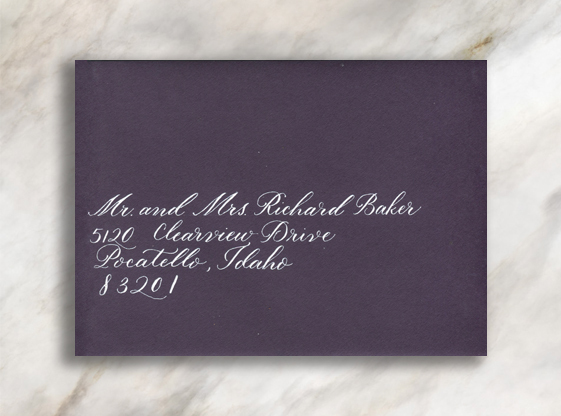 Flourished letters add a black tie air to a traditional style. A more casual style with a strong spine and lightly flourished majuscules. If you're looking for something tailored but not so formal, this style is adorable and very trendy. 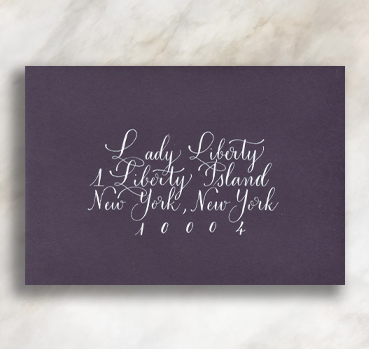 Characterized by its uniquely lowercase alphabet, this airy option is great for the understated & elegant. This mix and match script is characterized by a bold brush stroke and a block capital subscript. This option is made for lovers. Perfect for uniting couple's first names, mr <3 mrs, or a <3 between your guest's first and last names.